Solo Travel never really appealed to me until recently. As I settle into myself in my 30’s, solo travel sounds more and more like an adventure with someone I enjoy rather than a stretch of loneliness. 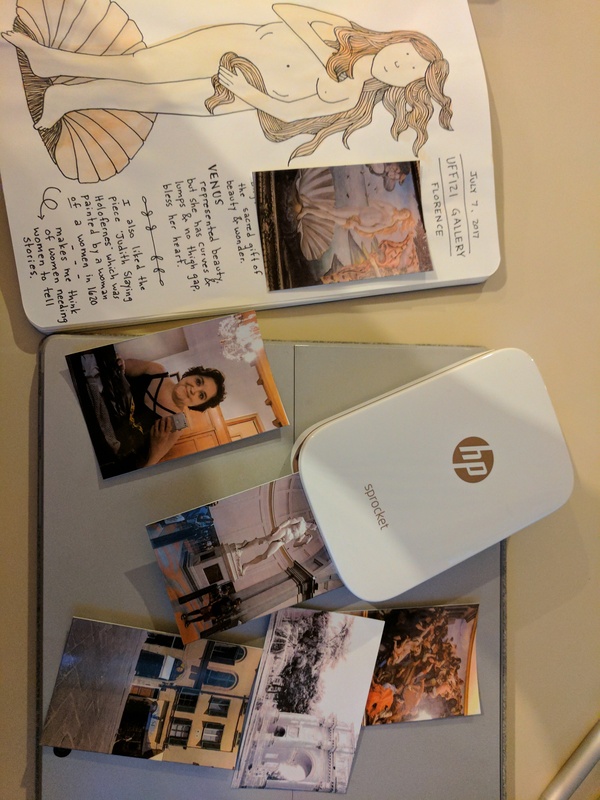 traveling with a Sprocket printer meant I could print photos for my travel journal on-the-road. Visiting Italy in July was a timely challenge to my burgeoning sense of body positivity. This photo was significant, as it’s actually a shot of me wearing shorts in public since I was a teenager. where I learned to love prosciutto and melon. Florence was a perfect destination for the first leg of my first solo international trip. I remember traveling in France with a companion in 2009, and how overwhelming it was to be in a place where I couldn’t not communicate in the language I knew- but I think I’ve become accustomed, in abstract ways, to moving in worlds where the “language” I speak (think: love language, or communications styles) isn’t the language of the culture around me. At any rate, getting off the train in Florence felt exhilarating and scary- but scary in a good way. The ceiling of the Florence Air BnB I selected specifically for this chandelier view. For my first full day in Florence my only goal was to see Michelangelo’s David at the Galleria de Academia. Various scalpers warned of a 2-hour wait, but visiting at 2 pm on a Thursday in July, my wait in the line was under 30 minutes. (This is when having a book in your bag, as a solo traveler, is really handy.) With sunscreen and a book handy, the wait was actually pleasant even in the heat. A helpful hint about the Galleria Academia. The line can seem like it is not moving, this is because the museum admits a large number of people at once to enter security and ticketing, so the line can not move for 20 minutes, then suddenly advance 30 feet. With no pressure to have an agenda, I found that my favorite way to enjoy Florence was to wander. Allowing myself to get lost over and over again (relying on google maps and a couple battery backups to be sure I found my way home safely) proved to be a delightful way to explore the city and find little gems of the old city that could have so easily been lost in a quest to accomplish an itinerary-style sightseeing tour. The rich density of Florence’s sights makes it a great city to explore in this way. From this old fountain visitors could fill their bottles with still or sparkling water. Want to read more about my solo stay in Florence, Italy? Check out my post on learning to Truffle Hunt in Florence. In Florence, I stayed in a little Air BnB on the second floor of the first apartment building with green shutters.